Fîraz Dağ (Mehmet Aksoy) was from the Elbistan district of Northern Kurdistan in Maraş province. He grew up London after his family’s migration to Europe. Since the early years of his youth, he has never been separated from the path of anti-capitalist, democracy and human rights struggle as part of the rightful struggle of the Kurdish people. Especially after the Şengal massacre on August 3, 2014, he ceaselessly carried out work and gave all his effort to inform and organize the Kurdish community and many others. He is the founder and editor-in-chief of Kurdish Question, which examines the problems of the Kurdish people and other ethnic groups, and has managed the virtual platform for a long time. He completed university education on film making and took his place in many literary organizations. He produced pieces in cinema, literature and other fields of art with a series of short films, poems, and poetry. He wrote evaluations and managed the internet platform Kurdish Question, where he gave a lot of space to explain and advocate the Kurdish Freedom Movement, the Rojava revolution and the women’s struggle to the international community. With a heart beating with the passion of freedom for his people, Comrade Fîraz felt the longing for freedom in Kurdistan, and while his patriotism lived at the deepest level, he kept this spirit alive and never let go of his identity. He became the loud and clear voice of his people when they were massacred in Kurdistan, because he wanted the whole world to find out about these atrocities. When Kobanê was attacked by Daesh gangs in 2014, he led the Kurdish people in London’s streets and train stations with great determination and willpower. He believed strongly that the YPJ and the free women of Rojava was a beacon and model to the Middle East, and told, through his words, about their revolution. Comrade Fîraz came to the conclusion that the freedom and hope of a free life were under the philosophy of the Freedom Movement and Leader Apo. He was in search of the free life and found it in Leader Apo’s ideas. Although Fîraz grew up in England, one of the centres of the capital system, nothing but revolutionary life could satisfy him. So, on his way to the source of free ideas, he came to his country. Comrade Fîraz, who could not accept for himself a life in the midst of Modern Slavery, headed to Rojava in order to record the Kurdistan Revolution into history with a pen and camera. We will adhere to the struggle and life line of our comrades martyred at such a time; we repeat the word that we will walk and fight like them and reach victory. On the way of Comrade Fîraz; we will grow and strengthen our struggle in the free press line. As Kurdistan’s freedom fighters, we will undoubtedly triumph in our struggle. Because our life philosophy consists of struggle for the sake of a free life. It is resistance against the persecution of the cruel. As this philosophy continues to live in the minds and hearts, the tyrants will never win! Violence broke out at a New York hotel Thursday afternoon when protesters disrupted a speech by President Recep Tayyip Erdogan of Turkey. In the middle of Mr. Erdogan’s speech, delivered in Turkish, a man — one of a handful of protesters — screamed in English: “You’re a terrorist. Get out of my country!” The ballroom at the Marriott Marquis hotel in Times Square instantly erupted, with many attendees chanting Mr. Erdogan’s name to drown out the protesters. After shouting at the Turkish president, demonstrators were punched and slapped by audience members as they were escorted out of the event. By VOICE OF AMERICA on Publish Date September 21, 2017. Photo by Voice of America. Videos showed the protesters — one of them wearing a T-shirt emblazoned with a picture of Michael Israel, an American who was killed in a Turkish airstrike while volunteering with the Kurdish People’s Protection Units, or Y.P.G. — being punched and slapped by several attendees as security personnel removed them from the room. Security also removed at least one person who had assaulted the protesters. Meghan Bodette, who identified herself as one of six protesters (one of whom was filming), said their goal was “to call attention to the Turkish state’s war crimes and human rights abuses against the Kurdish people,” both in Turkey and in Syria. “Erdogan should not be able to speak here unchallenged, and we challenged him because the American people need to know that a state that claims to be our ally is hindering the fight against ISIS in Syria and destroying civilian lives,” Ms. Bodette said in a Twitter message. Halil Demir, a Turkish-American who works for a humanitarian organization, said he had been standing near the back of the room when three protesters stood up in rapid succession: a young man, a young woman and a middle-aged man. The woman held a green banner, Mr. Demir said. Ms. Bodette identified it as the flag of the Women’s Protection Units, or Y.P.J., the female counterpart to the Y.P.G. The young man was pulled out of the room, Mr. Demir said, and the woman left on her own after being told to do so. But Mr. Demir said he saw security guards push the middle-aged man, who fell to the ground. He did not know whether the guards were part of Mr. Erdogan’s detail, the United States Secret Service or the hotel’s security team. Mr. Demir said he later saw the man on the floor, handcuffed, outside the ballroom where Mr. Erdogan was speaking at the invitation of the Turkish American National Steering Committee. Cemil Akgun, 44, a Turkish textile producer who was in New York on a business trip, said Mr. Erdogan appeared unfazed. He resumed speaking less than two minutes later. The New York Police Department said about five protesters were “briefly detained.” No arrests were made, and no injuries were reported. Kathleen Duffy, a spokeswoman for Marriott International’s New York City hotels, estimated that more than 2,000 people had attended the event and said that only “a very small” number had been escorted out. Mr. Davis cautioned that the understanding of what happened was still preliminary. A police official, who spoke about the investigation on the condition of anonymity, said it appeared the fight had been instigated by competing protesters, not by Mr. Erdogan’s security forces, who have a history of violent run-ins in the United States. In 2011, the security forces took part in a fight at the United Nations headquarters in New York that sent at least one officer to the hospital. Last year, they, along with police officers, clashed with demonstrators outside the Brookings Institution in Washington. In May, during Mr. Erdogan’s last official visit to the United States, members of his security team attacked a group of peaceful protesters outside the Turkish ambassador’s residence in Washington. Nine people were hospitalized, and video showed the episode in vivid detail. Another video emerged showing Mr. Erdogan himself watching the attack from a Mercedes-Benz sedan parked a few yards away. A grand jury in Washington indicted 15 Turkish security officials, as well as four civilians, on assault charges in August. That attack and the subsequent charges strained the relationship between Washington and Ankara, already tested by Mr. Erdogan’s authoritarian actions in Turkey. The State Department condemned the violence and said actions intended to limit free speech would not be tolerated on American soil. 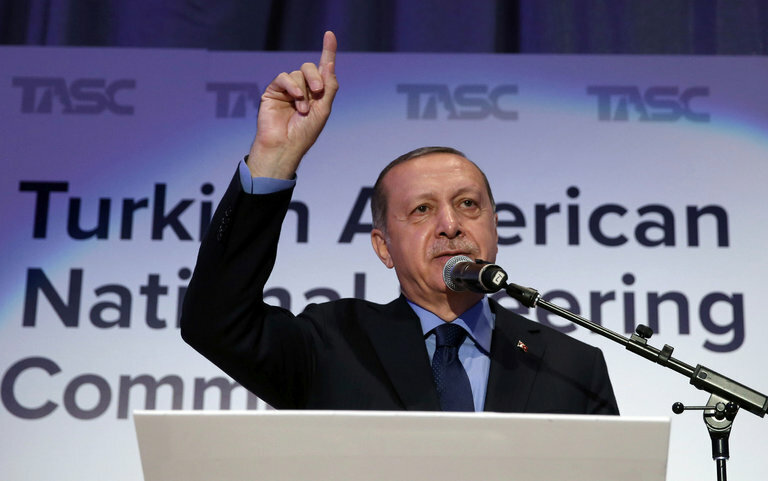 Mr. Erdogan, for his part, accused American officers on the scene of bungling the situation. After Thursday’s episode, however, Mr. Erdogan — who was in New York for United Nations General Assembly meetings — seemed unbothered. Immediately after his speech, he met with President Trump and American diplomats, and he and Mr. Trump had little but praise for each other, at least as they smiled for photographs. “We are as close as we’ve ever been,” Mr. Trump said. An earlier version of this article misidentified the person depicted on one of the protesters’ T-shirts. It was Michael Israel, an American who was killed while volunteering with the Kurdish People’s Protection Units, not Abdullah Ocalan, the jailed leader of the Kurdistan Workers’ Party. Trotz des heftigen Widerstandes wollen die Kurden im Nordirak ein Unabhängigkeitsreferendum abhalten – sehr zum Ärger der Türkei. Staatspräsident Erdogan fürchtet, es könne Nachahmer im eigenen Land geben und droht mit Sanktionen. Der türkische Staatspräsident Recep Tayyip Erdogan hat dem Nordirak wenige Tage vor dem geplanten Unabhängigkeitsreferendum mit Sanktionen gedroht. Das Kabinett und der Nationale Sicherheitsrat in Ankara würden am kommenden Freitag darüber beraten, ob und gegebenenfalls welche Sanktionen verhängt würden, sagte Erdogan am Rande der UN-Generalversammlung in New York. Sicherlich würden solche Strafmaßnahmen aber „keine gewöhnlichen“ sein. Kurden-Präsident Massud Barsani will am kommenden Montag trotz starker Widerstände in einem Referendum über die Unabhängigkeit der kurdischen Autonomiegebiete im Nordirak abstimmen lassen. Die Zentralregierung in Bagdad schließt ein militärisches Eingreifen nicht aus. Auch viele westliche Regierungen wie die USA und auch die Vereinten Nationen wandten sich gegen das Vorhaben, das den Kampf gegen die Terrormiliz Islamischer Staat (IS) gefährde. Barsani pocht dagegen weiter auf Zugeständnisse aus Bagdad. Er bekräftigte, es gebe für ihn bislang keine Alternative zu dem geplanten Abhalten des Referendums. Barsani hatte dem irakischen Ministerpräsidenten Haidar al-Abadi am Vortag ein Ultimatum von drei Tagen gesetzt. In dieser Zeit solle er ihm ein Angebot unterbreiten, das eine Verschiebung der Abstimmung ermöglichen würde. Die Türkei unterhält zwar enge Beziehungen zur kurdischen Autonomieregierung im Nordirak, ist aber gegen einen unabhängigen Kurdenstaat. Ankara befürchtet, ein solcher könnte separatistische Tendenzen unter den Kurden in der Türkei verstärken. 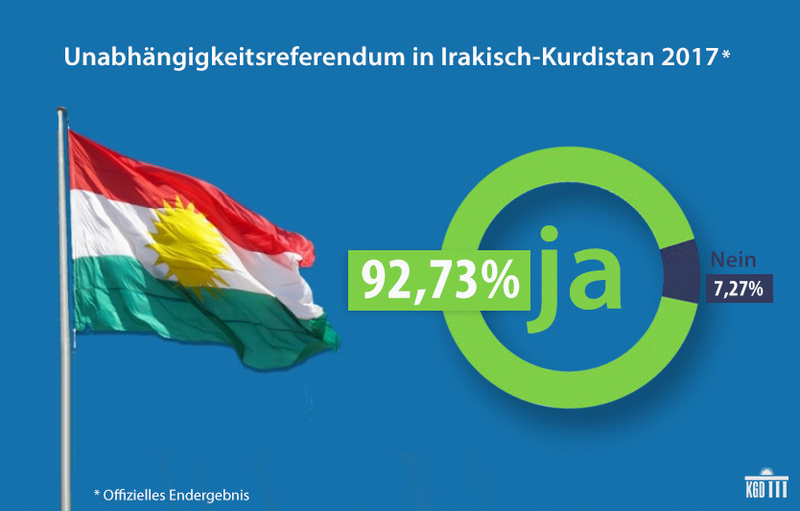 Vor dem umstrittenen Unabhängigkeitsreferendum der Kurden im Nordirak hat der irakische Vizepräsident Nuri al-Maliki der Minderheit gedroht. „Wir warnen die Unterstützer des Referendums vor den gefährlichen Auswirkungen, die diese Maßnahmen auf die Souveränität und Einheit des Iraks haben werden“, sagte er nach Angaben seines Büros bei einem Treffen mit dem US-Botschafter im Irak. agdad werde die Schaffung eines „zweiten Israel im Nordirak“ nicht dulden. Das Referendum, das am 25. September abgehalten werden soll, sei weder im Sinne der Iraker noch der Kurden und müsse abgesagt werden. Trotz internationaler Kritik halten die Kurden aber an den Plänen fest. Ihr Präsident Massud Barsani hatte am Freitag jede Verschiebung ausgeschlossen. Auch das Weiße Haus hatte die Pläne als „provokant und destabilisierend“ kritisiert. Die US-Regierung habe der kurdischen Regionalregierung mehrfach erklärt, dass ein Referendum „von den Bemühungen zur Zerschlagung der Terrormiliz IS und zur Stabilisierung der befreiten Gebiete ablenkt“, hieß es in einer Erklärung. Iraks Nachbarn mit einer kurdischen Minderheit – die Türkei, der Iran und Syrien – sind angesichts der Abstimmung besorgt, dass auch die Kurden in ihren Ländern zu einem stärkeren Streben nach Unabhängigkeit ermutigt werden könnten. So schloss der Iran, der die Kurden im Nordirak bislang als Brüder und Verbündete angesehen hatte, eine Zusammenarbeit im Falle der Unabhängigkeit aus. Das geplante Referendum sei weder legal noch vorteilhaft für die Sicherheit des Iraks und die Region. Der Iran wäre dann auch gezwungen, schärfere Grenzkontrollen einzuführen, sagte der Sekretär des nationalen Sicherheitsrats, Ali Schamchani, laut iranischer Nachrichtenagentur ISNA. Auch UN-Generalsekretär Antonio Guterres hat sich kritisch über das geplante Unabhängigkeitsvotum geäußert. Ebenso wie die USA ist er der Meinung, dass das Referendum „von der Notwendigkeit eines Sieges“ über die Extremisten-Miliz ablenken würde, hieß es in einer von einem UN-Sprecher verlesenen Erklärung. Stattdessen sollen offene Fragen „durch strukturierten Dialog und konstruktive Kompromisse“ gelöst werden. Amidst the chaos of the Iraq and Syrian War, independent photographer and director Joey L. embeds himself with Kurdish guerrilla organizations on the frontlines against ISIS. Without the constraints typical of our mainstream media, Joey offers a deeply personal, humanizing, and controversial view of the war. Du browst gerade in den efendisizler Weblog-Archiven nach dem Monat September 2017.